In May, 2004, Governor Brad Henry signed into law Senate Bill 1347, “State of Oklahoma: Art in Public Places Act,” a bill that supports public art in Oklahoma. The law incorporated artwork in, on, or near new state buildings or those with major renovation projects. The Oklahoma Arts Council states that public art reflects the local environment, cultural values and artistic vitality of Oklahoma communities. It offers opportunities for local artists and allows Oklahoma communities to express their identity, spirit and pride. More than 350 public art programs across the U.S. support projects in airports, libraries, parks, government buildings and neighborhoods and some 28 states have public art laws. The National Council on the Arts has stated that "there is a response to the world which may be termed aesthetic awareness." Cultivation of this awareness is a social good as it quickens the experience of life and enhances its quality. 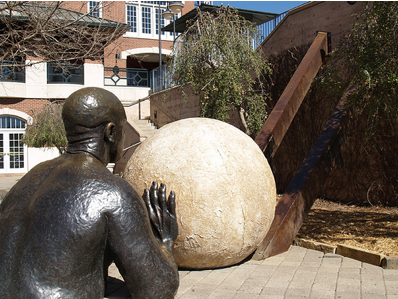 Public art pieces enhance the confidence, vitality, optimism and beauty of a community.Public art revitalizes suburban areas, can spark economic development and identify buildings or facilities. A public art program fosters successful partnerships between the private and public sectors and encourages artistic collaboration among professional disciplines engaged in urban design. It has been widely acknowledged that the inclusion of visual arts in the public eye adds dimension, depth and character to a community, inspires young minds, reinforces a local identity to which citizens can relate and take pride in and generally adds to the beauty and quality of life. Public art can make a unique contribution to the life of a city by sensitively and creatively manipulating a man-made environment in places where city inhabitants, employees and visitors congregate, pass through or use on a daily basis. The City of Edmond has a highly successful Art in Public Places Program. It is good for the city and good for business. The program is a public/private, donor-driven collaboration. HOW IT WORKS: A private citizen or business person selects a work of art and chooses a publicly accessible location in Edmond, then submits this request to the Visual Arts Commission. Upon approval of both the art and location, the city pays one-half the price of the artwork. The city then takes title to the art along with the obligation of maintenance and repair. The donor not only sees the art placed on the property they selected, he or she also gets a tax donation write off for the donor’s half of the price paid. More than 100 works of art have been acquired in the city program in only six years. The city annually allocates $200,000.00 to the program; funds which cannot be spent unless matched equally by private donation. CITIZEN REACTION: When the first six artworks were ordered, there were a few who complained about spending tax dollars for art. But when the first works were installed the criticism faded and some critics even became proponents of the program. RESULT: The art elevates the aesthetic look of the city. People (customers) come from other areas to enjoy Edmond’s relaxed atmosphere and spend their tax dollars. The program has been acclaimed in Southern Living, Oklahoma Today, Art of the West and Southwest Art.